I am getting the hang of WordPress. I hope that you like my new blog! So this week I participated in Mary Jo’s sketch challenge at www.technostamper.com. I have to say that I really liked this sketch!! So I used my current favorite paper from the Spring Catalog which is Poetry Prints. I love the colors and designs in this pad of designer paper. I also used the March Best of Stamp set which is Best of Flowers. That hydrangea was one of my all time favorite floral images so of course I had to use that! For colors, I used Raspberry Ripple cardstock and Lucky Limeade. THese are two of the current in-colors that are incorporated into this designer paper. That is the one thing that I really love about Stampin’ Up! designer paper, is that all the colors coordinate with the card stock. I stamped the image in Raspberry Ripple ink on vanilla cardstock. I used a blender pen and picked up a little ink from the raspberry ripple ink pad to fill in the flower. I used just a touch of lucky limeade ink to fill in the leaves on the image. And I used the Masking technique to bring the hydrangea in the center out front and center. To do this, stamp the hydrangea image on a post it note and cut around the image. Stamp the image on your cardstock and then place the post-it over the image and continue stamping around it. When you pull the post-it note off, your first image will be in the front. Then of course I had to add a little dazzle to the card! What is a card without bling?? 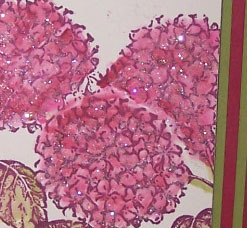 I used a glue pen and lightly dabbed the flowers and sprinkled a little dazzling diamonds glitter on the flowers. I didn’t completely cover the flowers, just dabbed them. I know that these pictures don’t do this card justice! Here is a close up of the flowers. I love the layers on this card too!! Great sketch Mary Jo!! Stay tuned as I think I will be designing some card layouts to use with this Floral Set!! Enjoy! I can’t wait to see what my fellow stampers have designed!! 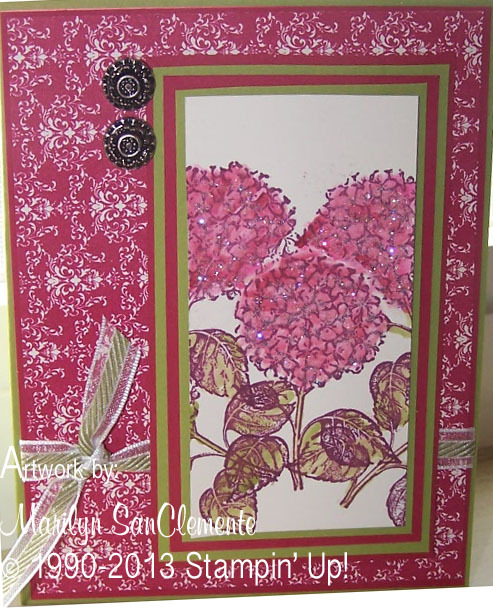 card making, handmade cards, hydrangea, Stampin' Up!. Bookmark. Your blog looks great, and so does this card. I may have to get this flower set just for the smaller version of this stamp! So pretty! Thanks so much for playing along with my sketch challenge this week! Very pretty. Love that paper also. Your coloring is fabulous. Thanks for playing with us at TSSC. Thanks Mary Jo and Robbie. I love doing sketch challenges! !